Toronto’s red-hot condo rental market is showing no signs of cooling down. 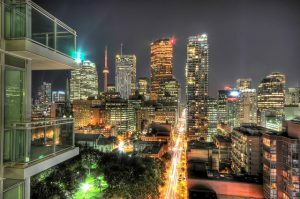 The second quarter report from the Toronto Real Estate Board (TREB) points to an astonishing 22.9 per cent boost in suite rentals since the same time last year. The total number of condos listed for rent also saw a big hike, moving from 8,893 is the second quarter of 2012 to 10,284 this year, for a 15.6 per cent increase. Bachelor pads saw the largest year-over-year increases in average rent. In this year’s second quarter, the going rate for studio suite is $1,335, up 3.9 per cent from $1,285 in 2012. The largest segment of the market is taken up by one-bedroom condos, which rose in price by 3.5 per cent to a new average of $1,611 in 2013. One-bedroom rental stock also saw the biggest surge in leased properties: in the second quarter of this year, 3,184 were leased, up 25 per cent from 2,548 the same time the year before. The only condos to see leases and prices dip were the much more rare 3-bedroom suites. In 2013, 116 units were leased, down 7.9 per cent from 126 in 2012. Prices also saw a dip: the average cost in 2012 was $2,625 and fell by 4.9 per cent to $2,496 this past quarter.